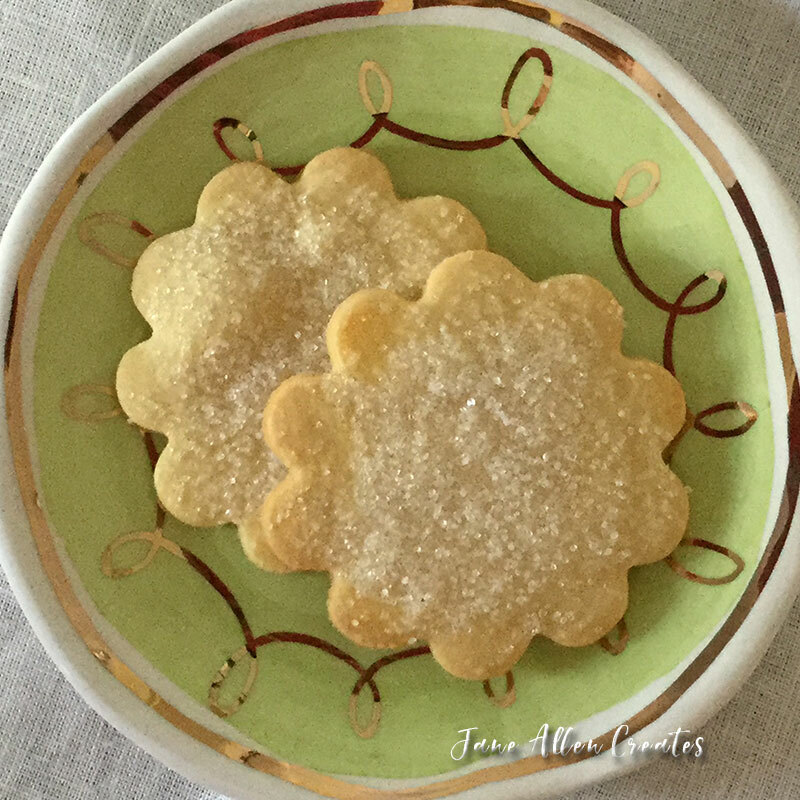 Well the holidays are over but if you are like me and still craving something a little sweet I think you would enjoy these rolled sugar cookies. They are from the book “Great Cookies” by Carole Walter. I would recommend this book. I have already made many wonderful recipes from it. I like to think that they are a cookie for every season because you can change them up by the shape of the cookie cutter and the color of the sugar you use on them. I also like that they look special without a lot of work. Place the flour, confectioners’ sugar and butter in the bowl of a food processor fitted with a steel blade. Pulse four or five times to combine, then process for 10 seconds, or until the mixture is the texture of fine meal. Combine the yolks and vanilla and, with the food processor off, add to the work bowl. Pulse two or three times, then process for 8 to 10 seconds, or just until a mass forms. Position the shelves in the upper and lower thirds of the oven. Heat the oven to 3500. Working with one-fourth of the dough at a time, roll on a floured pastry cloth or a lightly floured flat surface until 3/16 inch thick. Using a 2 ½ inch scalloped cookie cutter, cut the cookie from the dough. Transfer the cookies to a cookie sheet and brush lightly with the egg wash, and sprinkle with decorative sugar. Bake for 10 to 12, or until the edges are just golden brown. Reverse the cookies half way through baking. Let them rest on the cookie sheets for 2 minutes before loosening with a thin metal spatula. Cool on wire racks. This recipe makes about 3 dozen 2 ½ inch cookies. I am already thinking about making them using my flamingo cookie cutter and using hot pink sanding sugar. I am ready for summer, what about you? I hope these become a favorite with your family. I am not compensated in any way for the products mentioned in this post. I am just sharing with you things that I love and make my baking more enjoyable and hope that they will also bless you. Jane your cookies look so yummy…and easy to make. I’ve never thought of covering a rolling pin and board with cloth, must try this, sounds like a great idea! Thank you Effie. My mother only baked cookies at Christmas and never roll out cookies, she thought they were too hard. Her aunt made all these wonderful roll out cookies and I asked her to teach me. She used a pastry board and tacked a cloth on it which wasn’t easy because of the board being so hard. But using the cloth and rolling pin cover made it so easy to roll out the cookies. It even allowed you to make paper thin sandtarts. I found this board and cover at a cooking store and it made rolling out cookies so easy. Thanks for that Jane, I ‘ll need to look out for these cloth covers, your cookies look perfect! Oh, yummy! They are beautiful, too! I have this book too! When you have books like that with so many recipes it is nice to hear about the ones others have tried. Another favorite of mine for Cookies is “King Arthur Flour’s Cookie Companion”. As it happens I haven’t tried this recipe yet. I prefer to make cut-out cookies outside the Christmas holiday so they can be the star of their own show, so I’ll probably give it a whirl soon. Thank you Freda, I just realized they are on the cover. A couple other favorites are the pecan tassies and the coconut lemon lime tassies. I also liked the chocolate snowcaps and almondates. The brandy snaps were also yummy. I also made some of the biscotti and enjoyed them. I am actually surprised how many things I made from the book. I am a big fan of king author and have their cookie book. I also like all American cookie book by nancy Bauggett and cookies unlimited by nick Malgieri. I just got the perfect cookie by America’s test kitchen and it is loaded with recipes I would like to try, but have not done it yet.